(Francisco Kjolseth | The Salt Lake Tribune) Gov. Gary Herbert and others announce the creation of a community teen suicide prevention task force to combat the state's rising youth suicide problems during a press event at the Utah Capitol on Wed. Jan. 17, 2018. Also pictured are Rep. Steve Eliason, left, and Lt. Gov. Spencer Cox, at right, who will co-chair the task force and Troy Williams, executive director for Equality Utah, in background. Youth suicide in Utah has been increasing at a shocking rate. From 2011 to 2015, youth suicide has increased 141.3 percent. That is nearly four times faster than the national average. In fact, suicide is the leading cause of death for children ages 10-18 in Utah. Of those lost youth, 78 percent were male, 35 percent had a mental health diagnosis and almost 24 percent told someone they intended to commit suicide. In the wake of popular television shows romanticizing suicide, and even a Utah court case prosecuting for murder a teenager who encouraged a friend to commit suicide, Gov. 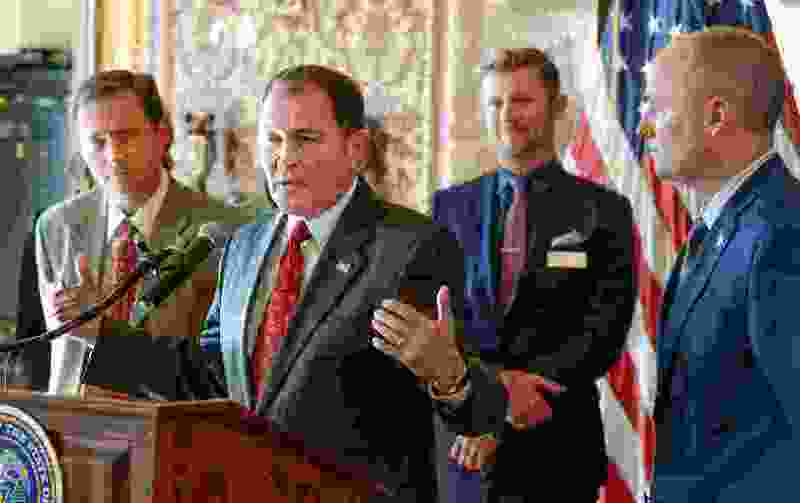 Gary Herbert has organized a task force, led by Lt. Gov. Spencer Cox, to study this issue and suggest recommendations by Feb. 15. A few solutions already mentioned include limiting access to guns, by using trigger locks or gun safes, and increasing programs in school such as the smartphone application called SafeUT. Cox, who became emotional as he shared his personal experiences with being bullied as a teenager, admitted he had had similar dark thoughts during his teenage years. Almost 20 percent of youth do. Unlikely partners on the task force include The Church of Jesus Christ of Latter-day Saints Quorum of the Twelve member Elder Ronald A. Rasband and Equality Utah Executive Director Troy Williams. Both seem ready to work together in good faith to stop this epidemic. Some claim that much of Utah’s high youth suicide rate is attributable to gay and lesbian youth, especially those who are members of the LDS Church. But the data don’t bear that out, yet. They also don’t disprove it. In its investigation, the CDC found that of 40 individuals where sexual orientation could be determined, six identified as gay or lesbian. But a 40-person sample size is too small to draw many conclusions, and other evidence is anecdotal. With an LDS Church high-ranking apostle on the task force committed to finding solutions, it appears that the church is open to the idea that much of Utah’s teen suicide problem is related to complicated feelings about sexual orientation and church membership. If the religious aspect is playing a larger role than the numbers can tell, which many believe is the case, the LDS Church, and other churches in Utah, need to face that grim reality and implement needed solutions. Anyone experiencing suicidal thoughts can call the 24-Hour National Suicide Prevention Hotline, 1-800-273-TALK (8255), or one of Utah’s crisis lines statewide. Gun locks are also available if you email gunlocksUT@gmail.com. Preventing suicide goes beyond one church and a few committed people. Utahns need to embrace the other, provide access to help for the desperate and confront what’s become a public health crisis head-on. This task force and its sense of urgency is a good start.